In 2001, a new restaurant appeared on Marylebone High Street. The Providores and Tapa Room, opened by Peter Gordon, Michael McGrath, Anna Hansen and Jeremy Leeming, was a brave new adventure into London’s culinary landscape. At that time, Peter’s eclectic style of cuisine, now known as ‘fusion’, had been delighting the public and outraging the more conservative critics in equal measure, as it emerged from The Sugar Club kitchens in Notting Hill and West Soho. At their new restaurant, where Peter and the team were free to fully express this exciting culinary vision, they opened their doors and waited to see what would happen. The rest, as they say, is history. 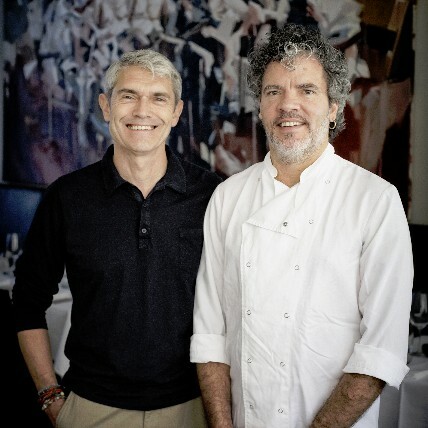 Executive chef Peter and general manager Michael, now joint owners of The Providores, look back over 15 years of fusion food, angry critics and feeling like elder statesmen. When The Providores first opened, what were you hoping for it to be? MM: We wanted the kind of cafe / restaurant /dining room we loved in New Zealand, but in a way that was relevant to London. We wanted a comfortable, cool place where all sorts of people would feel welcome—a place that would see business meetings over coffee, families in for lunch and friends for afternoon tea. Then in the evening, people could come to dine in a more sophisticated and relaxed atmosphere. PG: I actually remember the pitch that we first gave to the Howard de Walden Estate: a place that served breakfast, lunch and dinner seven days a week, where women felt comfortable coming alone. The alcohol would be wine and cocktail focused, with a few beers. It would be somewhere Anna Hansen and myself would be able to do the cheffy-type things we wanted to, serving world-class food on small plates at a reasonable price. What do you remember of London’s restaurant landscape at that time? MM: I just remember thinking that if you wanted to get a really nice salad it was almost impossible without going to a very expensive restaurant. There was a real lack of medium price, well cooked meals using great ingredients. It was hard to get decent coffee—the whole coffee culture we are used to now had not arrived by that point. London had some wonderful restaurants, but things were just a little bit basic if you were looking for something other than the big night out. How do you see yourselves now? PG: When we opened we were this crazy new kid on the block, doing this crazy fusion food; now it feels like we have become the grandfather in a way. Some of the great young chefs that are around now were about 10 years old when we opened. 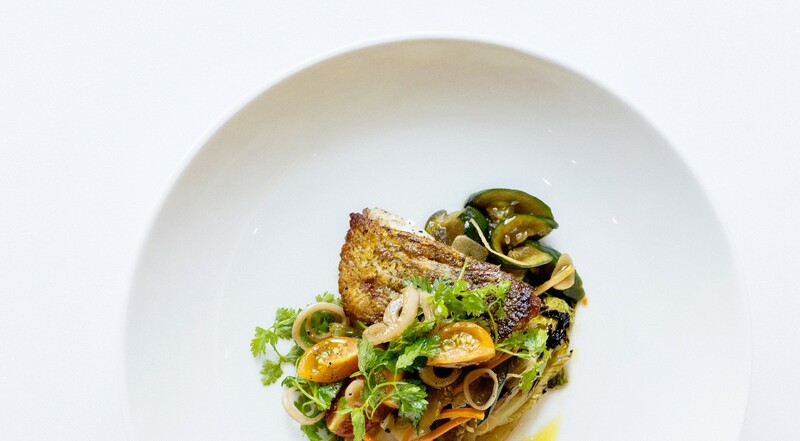 Our approach is the same as it was then, but with increased availability of ingredients—which is so important with the style of food that we do—being so much better, it means the food we serve has kept improving. MM: I was in New York recently and looking at menus, seeing what people were interested in, what they were doing. There are some wonderful things going on, but what we are doing here still feels current. Fresh juices, great coffees, small plates—all those things that we did from the beginning are now all around us. In a way, you could say we are more current than ever, because we are not so much of an outlier any more. PG: I really love cooking: I love it as a profession, I love cooking at home, I love discovering new ingredients. The ability to cook what I love has been a constant throughout my time and I’m lucky that there has been a public palate for the food I like to cook. It is so important. But while it is essentially my menu, Michael has a real input. We speak the same language of food, so if he thinks something has been on the menu too long or is not working, I will work with the team to create something new and interesting to replace it. I tend not to be too influenced by trends in food, but I do try to keep myself open to new experiences. One thing I have been trying to organise for a while is to take a sabbatical and go on a trip. I feel the need to head off and give things a bit of a shake up by opening myself up to new food experiences. How would you define your relationship with the ingredients? PG: I have a friendly, loving, inquisitive relationship with ingredients. I’m like a good grandmother. I’m not judgmental, I’m prepared to see their point of view and I try to see the very best side of their character. I will experiment with an ingredient that interests me—sometimes it works and sometimes it doesn’t, but it means I normally end up doing something that is non-traditional, which I find really exciting. Just imagine what it would be like to have written off soy sauce or miso paste because you were unfamiliar with them, or thinking you could only use them in specific ways. You would miss out on so much. Food and culture are of course intimately linked, but I think decoupling those elements can be hugely liberating in terms of inventiveness and sometimes lead to some genuinely great discoveries. MM: I think this decoupling of food from its cultural background is one of the reasons Peter’s fusion cooking can upset some people so greatly. The fact that a new combination works is not enough in some people’s minds to override the history of the ingredient and what that dictates, and it leaves them feeling profoundly uncomfortable. You are very ethically-minded. How is this apparent in day-to-day operations? PG: This is another area that has proved controversial in the past. I remember writing an article a few years ago, debunking some myth surrounding food miles. 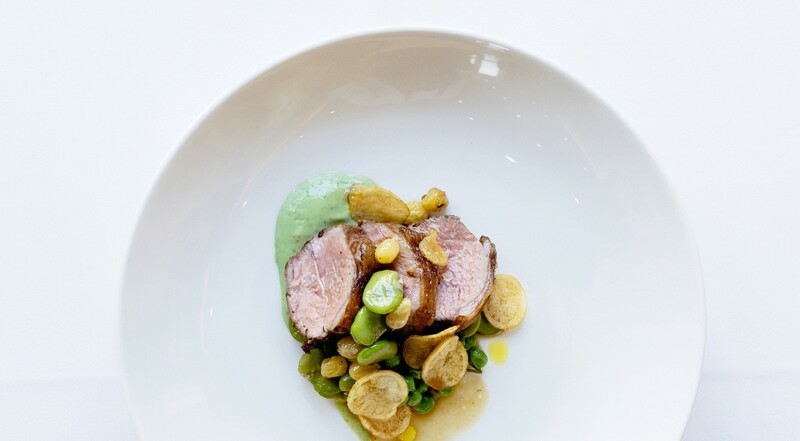 I was getting a lot of flak for using New Zealand lamb, but I knew that the carbon footprint of New Zealand lamb was less than the carbon footprint of much British lamb, because I had been fascinated by this whole area for years. New Zealand is mostly hydroelectric, not fossil fuel based and the animals live outside, not in heated barns. Also, when you transport goods by ship, it uses less fuel per kilo than a truck. So if you compare lamb from New Zealand with the carbon footprint of lamb transported across Britain by road, it is apparent that things are not nearly as clear-cut as they first appear. MM: It is the same with our fruit and vegetables. For example, tomatoes grown in Spain or Italy where the temperatures are right for them will probably be better for the environment than some grown in a hothouse closer to home. We don’t use asparagus from Peru, we don’t use air freighted strawberries and we only use them when they’re in the season. Ideally they are British, but sometimes they’re from other parts of Europe—but only where they are in season locally. We don’t buy any battery-reared animals, we buy fish from sustainable fisheries. Our wines are all from New Zealand, but these often have zero carbon footprint. Occasionally we will have to use something which is air freighted, like mangoes, because you can’t get them any other way. Of course we are always looking to improve, but we are comfortable with our product sourcing because we have looked very deeply into the environmental impacts of producing and transporting what we buy. We take the same care with our staff. We always try to be fair in terms of pay and conditions and I am always there to talk to if someone has a problem. It can sound a bit clichéd, but I believe in treating people the way I have appreciated being treated in the past. What are your thoughts, standing here, looking back over 15 years? MM: Firstly, how amazing it is that we’re still here; the fact that we have been able to keep going without compromising our initial aims. I’m proud that we have managed to keep The Providores fresh and relevant over such a long time, without losing the aspects people have come to love about it. I think that is a great tribute to Peter’s integrity in the kitchen. PG: Pride is the overriding feeling. I feel really proud that Mike and I are still business partners after 15 years; I think we make a great team. I feel proud that the concept we envisaged has stood the test of time. I take pride in the fact that we have created a community within the restaurant that is still working wonderfully well. I take pride in the fact that chefs like Anna Hansen, Selin Kiazim, Miles Kirby, Brad Farmerie, among many others, have gone on from our kitchen to have wonderful careers of their own. And I am proud that after 15 years, the people of Marylebone are still happy to call us their neighbourhood restaurant.